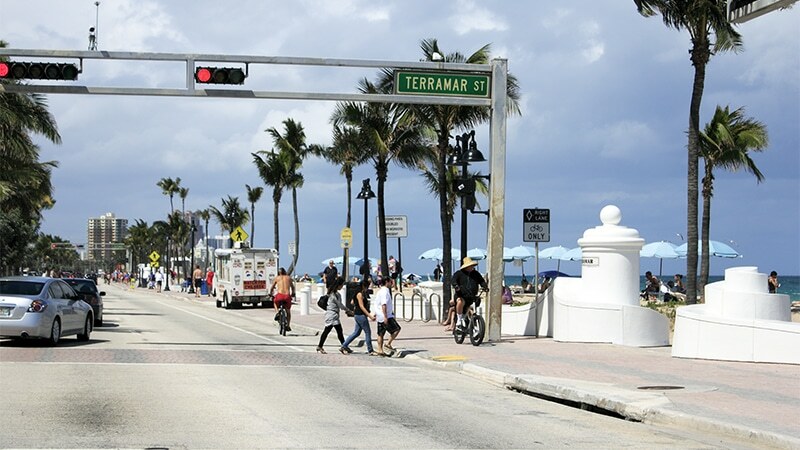 Whether you walk regularly to work or just occasionally around town, South Florida is the perfect place to be a pedestrian thanks to the year-round warm weather. Unfortunately, the Sunshine State also has one of the highest rates of pedestrians injured in accidents caused by careless drivers. Year after year, thousands of pedestrians are injured in accidents caused by careless drivers. Victims of these accidents must cope with serious, life-changing injuries, high medical expenses, and lost wages. The laws in South Florida protect pedestrian victims but it is up to victims to pursue damages with the help of an experienced accident attorney. If you or a loved one has been injured while walking, contact pedestrian accident lawyer Justin Weinstein. He will use his knowledge and resources to help you fight for the compensation you deserve. Fill out our contact form or call 954.845.0505. Though reckless drivers are more likely to cause a crash, pedestrians may also be at fault. Data from the Florida Department of Highway Safety and Motor Vehicles reveals that dozens of pedestrian accidents were a result of a pedestrian under the influence of drugs or alcohol. If you were hurt in an accident, contact pedestrian accident lawyer Justin Weinstein for a free review of your claim. You may be entitled to compensation. Fill out our contact form to speak with an attorney. The results of a pedestrian crash are often shocking; even accidents at low speeds can cause serious damage. Of all the 2015 Florida pedestrian accidents, 7,870 led to injuries and 632 were fatal. Despite improvements in vehicle technology and changes to road infrastructure, these types of accidents still happen. Pedestrians should know their rights and how to hold drivers liable after a pedestrian collision. According to the National Highway Traffic Safety Administration, Florida is one of the most dangerous states for pedestrians. Florida has the third highest number of fatalities. Between 2014 and 2015, pedestrian fatalities in Florida increased by 18%. Between 2015 and 2016, pedestrian crashes grew by another 2.79% while pedestrian fatalities rose by 1.72%. Smart Growth America, an organization that advocates for walkable cities, listed the South Florida area as the 11th worst area for pedestrians. Of the 10 most dangerous metro areas for walking in the U.S., 8 were in South Florida. There are a few avenues your pedestrian accident attorney may explore to collect damages. Personal injury protection (PIP) benefits, a claim for uninsured or underinsured motorist, or a lawsuit. Damages can also be covered by the other driver’s bodily injury coverage, if the other driver has been found at fault for the accident. PIP benefits are paid as part of Florida’s no-fault insurance requirements. If you have auto insurance, you may be entitled to up to $10,000 in insurance benefits. Otherwise, you can collect PIP benefits from the driver’s insurance company. However, you must have your injuries documented within 14 days of the accident to qualify for PIP benefits. If the driver fled the scene, does not have insurance, or does not have enough insurance, you may seek an uninsured or underinsured motorist claim through your own insurance company. If you have questions about your legal options, we can help. Call 954.845.0505. Being hurt in a pedestrian crash or losing a loved one this way can be devastating. Returning your physical health to its pre-accident state requires medical attention and time. But nothing can bring back your loved one. However, you can hold the driver responsible for the accident accountable for their actions with a trustworthy personal injury lawyer by your side. During this difficult time, you shouldn’t have to worry about dealing with insurance companies. Having a pedestrian accident attorney on your side means that you will have an advocate who will work tirelessly to help you get the compensation you deserve. For a free case evaluation, fill out our contact form.